Heat oil in large nonstick skillet on medium-high heat. Add chicken, onions and garlic; cook 5 to 6 min. or until chicken is done, stirring frequently. Stir in chili powder. Add peppers; cook and stir 2 to 3 min. or until crisp-tender, stirring frequently. Add olives, salsa and Cheez Whiz; simmer on medium-low heat 5 min. or until Cheez Whiz is melted and mixture is slightly thickened. Spoon down centres of tortillas. Fold up bottom of each, then overlap sides and roll up. 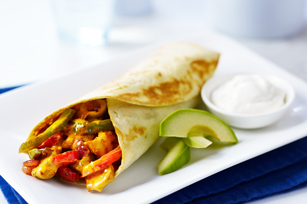 Warming the tortillas helps prevent them from cracking when wrapping them around the fajita filling. To warm the tortillas in the oven, wrap the stacked tortillas in foil, then bake in a 300ºF oven for 5 min. or until heated through. Or to warm them in the microwave, wrap the stacked tortillas in moist paper towels, then microwave on HIGH 15 sec. or until heated through.